The brewing process and consumption of Turkish coffee will surely send you upon another adventure into the amazing world of exotic coffee. 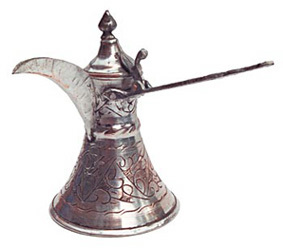 From the days of the Ottoman Empire in the mid-1400s (Central Turkey), to this very day, coffee has had a major impact on Turkish culture and lifestyle. During the Ottoman period, women could be found socializing over coffee and sweets. Men socialized in coffee houses, playing backgammon and talking politics. This ritualistic method of serving and consuming coffee has had a profound effect on political and social interaction, hospitality customs, and even prayer, betrothal, and gender customs throughout the centuries. Although many of the rituals are not as prevalent in today's society, this style of coffee has remained an integral part of Turkish culture that is as rich in flavor as it is in tradition. O.K. 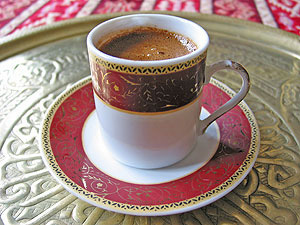 So What Exactly Is Turkish Coffee? 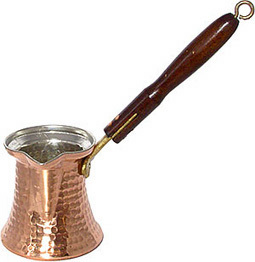 Turkish, also known as Greek, Arabic or Armenian coffee in their respective countries, is a style of coffee prepared by soft boiling finely powdered coffee beans in a pot called an Ibrik, (or Cezve in Arabia) of which I show several styles here. It may be brewed from black-to very sweet, and is served in small demitasse cups, where the powdered grounds are allowed to settle out. This type of coffee is common throughout the Middle East, North Africa, Caucasus, and the Balkans, and in their expatriate communities, and of course, in many fine restaurants all over the world. Turkish coffee is made from medium to dark roasted Arabica coffee beans that are ground to a super-fine, almost flour like consistency. Arabian Yemen Mocha coffee beans are a popular choice for brewing in this way. It is sometimes aromatically spiced with cardamom and other exotic spices. Since sugar is added to the coffee during brewing, spoons are not necessary. If properly brewed, this coffee is served with a beautiful golden foam on top, similar to the "crema" on a shot of espresso. It is said that if this crema is found lacking, the host or hostess would be disgraced. That's not too surprising since we would certainly feel likewise if our espresso had no crema here in our shop! If you would like to give this exciting brewing method a try, you'll find that our Arabian Yemen Mocha is second to none. 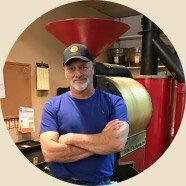 Click Here: Lakota Coffee Company and Roasters! We will be happy to pre-grind your coffee to a super-fine Turkish setting if you do not have an adequate grinder at home. 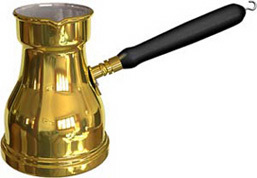 For proper grinding of Turkish Coffee, you will need a good burr grinder with an appropriate setting. Many grinders cannot go that fine. If shopping grinders, please be sure to check out our page on How To Grind Coffee Properly... Also be sure to read "The Lakota Guarantee" at the bottom of our Coffee Brewing Page.